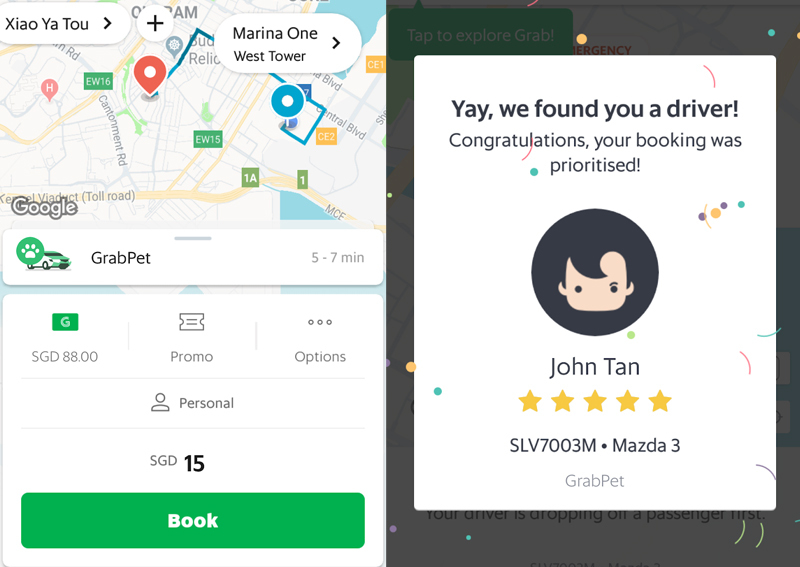 PET owners can now book a Grab ride on-demand with their animal companions on board, using the new GrabPet service launched in beta on Wednesday. The service, which charges fares from S$14, caters to all pets approved by the Agri-Food and Veterinary Authority of Singapore, except for birds. GrabPet also insures the animals on board. A maximum of two pets, each up to 41cm in length, or one pet over 41cm in length, will be allowed. Dogs will have to be leashed or in a crate, while the likes of cats and guinea pigs must be in a crate. Grab said that it has already provided training for "hundreds" of its driver-partners in pet-handling and will continue to train more. All GrabPet vehicles will be equipped with a foldable back seat cover and adjustable leash. Drivers will have to ensure their cars are well-maintained for regular passengers with microfibre towels and air fresheners, the company said. Grab has worked hard to roll out GrabPet and has taken care to include the insurance component, said Lim Kell Jay, head of Grab Singapore, in a press statement. "We're very excited to launch GrabPet because we know that many pet owners find it challenging to travel with their pets, given the limited transportation options available in the market," he said. "We welcome our driver-partners' and passengers' feedback on the new service so that we can continually improve it for all users." For every dollar spent on a GrabPet ride, passengers will receive up to six GrabRewards points, depending on their membership tier. The beta launch of GrabPet comes some nine months after Uber's exit from Singapore. Pet owners were at the time upset they could no longer use UberPET, the US ride-hailing firm's pet-friendly option. Last April, close to 1,300 pet owners signed an online petition urging Grab to continue the service.